After mesmerizing audiences with a spectacular opening of the 2010 Commonwealth Games (CWG), India Thursday brought down the curtains with pomp and pageantry. The first segment up was Agni, a tribute to India’s sporting spirit. Sanskrit mantras sounded out as exponents of Indian martial arts came front-and-centre. And if the fantastic prowess displayed by the fierce-looking warriors wasn’t enough, the fire-inspired pyrotechnics that were set off, left the audience completely mesmerised. As the Closing Ceremony was also meant to focus on India’s modern-day traditions, it was only fitting that bands from the Armed Forces get an opportunity to display their skills. A total of 650 musicians from the Indian Army, Air Force and Navy performed Military Marshal Music. The martial music combined with beautifully-synchronised in-formation marching proved to be a major hit, with the rendition of Saare Jahan Se Accha giving everyone Goosebumps. It was then time to look towards the future as 2010 children dressed in white came onto the field in a Tribute to Our Motherland. Vande Mataram sounded out as the kids fanned out to assume the positions of a Rangoli pattern with an Ashoka Chakra in the centre. This segment harked back to the Indian festival of colours, Holi. Bright colours were sprinkled onto the children, creating beautiful patterns that reminded one of the host nation’s colourful heritage that touches all aspects of daily life for its citizens. This cultural feast was just a build-up to our stars’ entrance for the Athletes Parade. Flanked by Delhi United volunteers, the athletes who provided us with tales of glory and heroism came onto the field. Greeted by thunderous applause, our friends from across the 71 nations of the Commonwealth came together in a Wheel of Life formation that signified the bonds created during Delhi 2010. 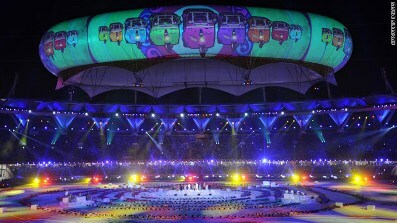 Athletes, officials, volunteers, dignitaries and spectators were then treated to a rich audio-visual show. The Golden Moments reminded us all of the world-class sporting action we were all lucky to witness from 3 to 14 October. In this short period, the billion-plus inhabitants of the 71 Commonwealth nations were privileged to be a part of moments that will forever be etched into our memories. 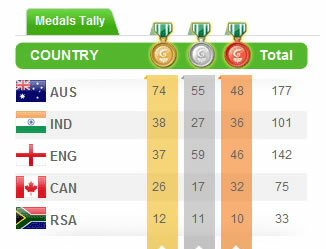 CGF chief Mike Fennell said that the athletes were happy with all the efforts Delhi had made to make them feel at home. “The feeling we got is that the athletes are, by and large, happy with all things,” he said. And the events too were complimented. “The competitions went well, and it was a comfortable and satisfactory experience. The venues were of very high standards and some were even exceptional.” Fennell, for whom security had been of paramount concern, said, “I have the highest praise for the security arrangements, and while it has been too stringent at times, it is better to err on the side of caution.” Games volunteers also received a special mention. “I also applaud the 22000-strong volunteer force. They have been appreciated across the board, as their enthusiasm, dedication and attention to the people has been exceptional,” Fennell added.